Newer cleaner burning alternative fuels like biodiesel derived from vegetable oils and E85 Ethanol produced from corn husk are now being added to current fuel supplies and refineries. Unlike many rubber hose products that can degrade when exposed to these new alternative fuels, the Willcox existing product line is more than capable of safely transferring these new alternative products. NL4300 Rackmaster is a heavy duty premium hose for use on bottom loading arms, it also incorporates a unique fire retardant barrier layer which allows it to be used for all fuels including aviation & JP fuels. For ordering popular assemblies refer to A4220/A4300 part #'s. 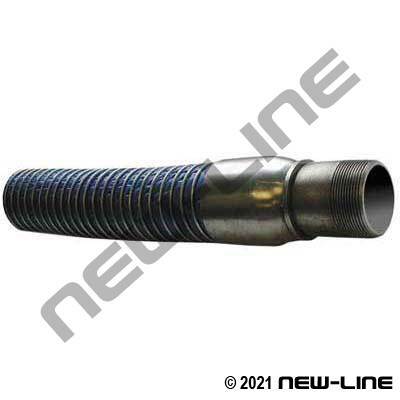 Typical Fittings: Carbon or stainless steel permanently crimped or swaged composite hose ends, tested & certified. N60006 Sleeve. Construction: Multiple layers of polypropylene fabric & polyester films with a PVC coated cover. Interior: Galvanized steel helix. Black exterior. Temperature Range: -30°C (-22°F) to +80°C (176°F), see our Teflon Composite for higher temperatures.